"An unusual blend of seasonings flavor this slow cooker meal that takes advantage of the abundance of asparagus available in the spring. In other seasons fresh green beans would be an option to replace the asparagus." Heat the oil in a skillet over medium heat. Cook the chicken in the hot oil until completely browned, 3 to 5 minutes; transfer to a slow cooker. Add the onion to the chicken; season with salt and pepper. 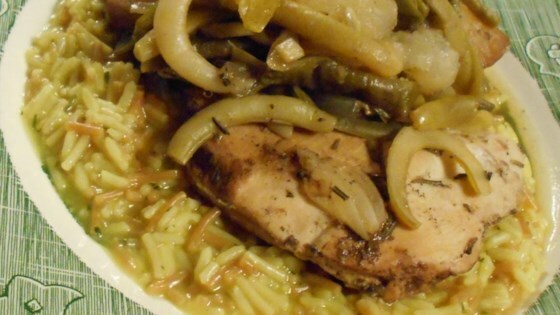 Place the pears and asparagus atop the chicken mixture. Mix the garlic, balsamic vinegar, apple juice, rosemary, ginger, and sugar together in a bowl; pour over the asparagus. Season again with salt and pepper. I don't get it. I thought this recipe sounded wonderful but turned out to be blah! Even the fresh ginger could not bring it to life. Not offensive but will not prepare it again.